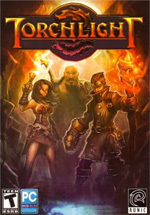 Word of Ember blazed across the land, and the town of Torchlight flared to life. Ember is the essence of magic and the keystone of alchemy; it lures the restless with promises of power and riches. Miners burrowed deep beneath the dirt streets of Torchlight, discovering veins of the ore richer than any found in living memory- but they were not the first to covet these mines. The miners broke through into the buried past, a dangerous labyrinth of caverns and ruined civilizations, twisted creatures and the bones of those who came before. Evil bubbles up from the depths and threatens to overrun this town as it has so many others. The heart of a villain has infused the Ember, and his darkness seeps through the veins. To survive, the townspeople must break the cycle of destruction; they need a champion who can destroy the evil at its root. Removing the source of the rot may purify the Ember, but it is a long and perilous journey. The champion must battle through rock and fire, through lost cities and ancient tombs, into the palace of the villain himself. Powered by PukiWiki. Thanks PukiWiki Developers Team. HTML convert time: 0.019 sec.